…but the darts have a mind of their own! Burda chose a pink floral for their version – maybe I should whip up another in my new sheets?! I’d rather the skirt was a bit longer, the unhemmed length felt perfect. The skirt is rather weird actually – shaped only with darts, two at front and one at back. Well my side isn’t flat, and my abdomen doesn’t need two darts! Now I look back at the magazine image, I wonder if the skirt isn’t meant to be a slight bell shape,and I’m filling it out to it’s capacity! I cut the size 38/40 – and I’m really a size bigger in the waist and hips. Can you see those instructions – just a few lines! I didn’t really use them, but I did search for ages through the pile of magazines trying to locate the just the right issue to check how they made the belt, and it said: “Make belt. Make bow and sew on” – helpful! I decided to make my belt fasten edge-to-edge with a couple of hooks and eyes, and the bow loop slides across to conceal them. It’s quite nifty! I’m planning on letting the hem down to it’s max and giving it a false hem – but I need to find something suitable first. And I took some photos when I was hemming the pleat area – so expect another tutorial soon. This looks great and fits you so nicely. Seeing your post this morning made me laugh because I just finished and posted a dress with a very similar silhouette for Julia Bobbin's Mad Men Challenge. It's very pretty. Sherry thanks for including so much good information. I agree about the length. easier to sit in. Funny about the bow instructions, it came out looking perfect, I am glad you will be doing a hemming tutorial. looking forward to any tips in this area of sewing. It's a pretty and ladylike dress. The color is awesome. What a pretty dress and an awesome fit!! The colour is great on you and I think the design is also really lovely. I admire the fit – wish I could achieve something close to that. I love the French blue colour. I think it's a pretty dress and it definitely looks nice on you, but I agree it would be even nicer if it was an inch or so longer. I like skirts hitting just the top of the knee rather than an inch or so above. I've made a few things lately that I would have preferred if they had been just a tiny bit longer. It is perfect 1969…all you need is your hair to be in a “flip” style ala Marlo Thomas in “That Girl” on TV. You really tamed that fabric into a beautiful dress and I'm looking forward to the next tutorial! That is a gorgeous dress – I love the bow belt and the overall shape – it looks great! That is GORGEOUS! I love the colour and texture – goes perfectly with the make. Cardboard & all, this dress looks fantastic on you! Looks absolutely gorgeous and fits beautifully. 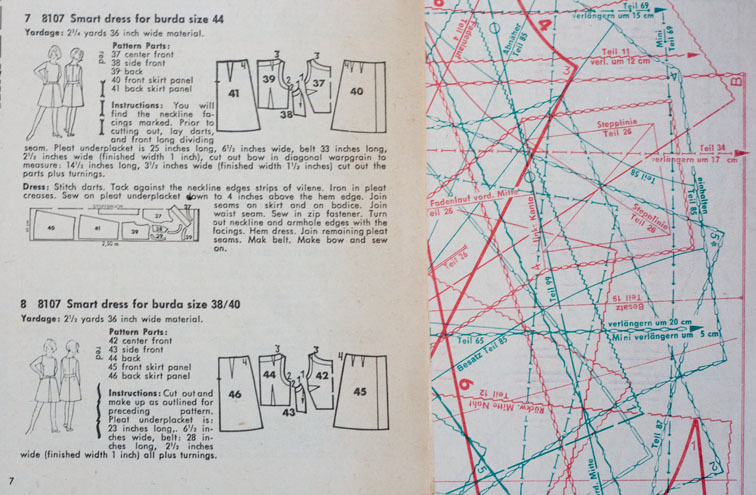 I have a fair number of the vintage Burdas you bought, including this issue, which has some lovely patterns, and have even traced this pattern ages ago but not made it up – your version is making me think I should get to it. great dress! I love the belt as well (and their crazy instructions for it!!) I think it fits perfectly! Gorgeous! I love the colour. The shape is perfect. You look stunning in it! I wish I had a dress like that. That's a cute little dress, and honestly, it is timeless. Nice sewing! 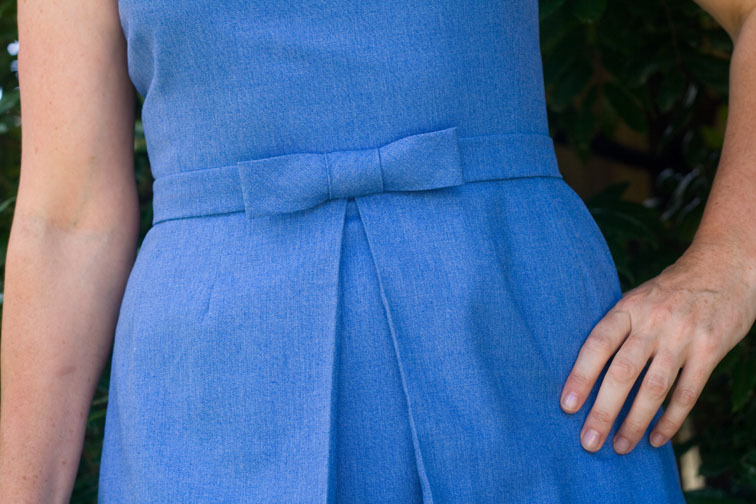 What a pretty dress – that blue is TDF! I love your dress. And, yes, make another. That's a very pretty style and colour. Are you going to enter it into the PR vintage contest too? It qualifies. It is very pretty on you. I think the fabric looks great. It may be a bit cardboardy now but perhaps it will soften up with time? I agree about the length, it is easier to sit in. Also, I am glad you will be doing a hemming tutorial. You really scored with that bundle of Burda from the 60s. Very cute dress, love the colour and the pleat. Sounds like the Burda instructions haven't improved that much. Beautiful job you did on the dress! It's perfectly authentic in that crisp fabric, and that color. I think the bust darts may reflect the different shape defined by the bras of the 60s, which made the bust apex higher and somewhat closer to center front. It looks great. I love the colour and the wee bow. Don't you love it how vintage patterns say things like, “Make belt”? They always assume so much prior knowledge. I'd love a flip style, but unfortunately my hair would never stay in that position unless I used superglue – sigh! Love your blog! I'm a sewing teacher and your blog is super love of info!!! Sherry, it's so pretty…looks like you're ready for spring. I have noticed on older patterns that they expect the sewist to have a lot more knowledge; more modern patterns have more detailed instructions. We used to go to the shop and we bought a set containing the material for the back of the belt and a buckel and some eyelets and instructions how to fix it. Even a tool to fix the eyelets was in the package. So it was sort of not Burda's concern how we fixed that belt. So do not overestimate our skills in that time. This is gorgeous, I love the colour you chose too! I also bought a couple of vintage burda magazines on ebay, but I haven't dared to try them just yet! Stunning dress. I love the simple bow belt and the colour is gorgeous. I don't know much about 60s fashion or fitting issues, but I think this dress looks fantastic on you! If it was roomier in the skirt, I wouldn't think it would pull open the pleat as much, which would be a shame. I think the length looks great too. There needs to be a word that means youthful-izing, if you get what I mean. This dress would totally go into my weekly rotation! Such a lovely dress! Interestingly, Vogue had a pattern almost the same a year or two ago. I love box pleat skirts and keep wondering if they'd work on me (have yet to try!). For some reason I often have trouble figuring out the best hemline with a-line skirts. I love your dress! It's a similar pattern, but a different look altogether! Yes it's amazing the difference one inch makes! I only took the hem up an inch, but it is a much better length unhemmed. Yes, they're a real maze aren't they! I definitely need a more conical bra for this dress – the darts finish practically on the BP, rather than set back from it! Very lovely and dainty! I admire your perseverance in figuring out the Burda patterns and tracing them!